Here is a short tutorial on how to bypass Start screen and log in straight to desktop in Windows 8.1. We have recently covered a tutorial on how to stop Windows Store apps from taking automatic updates. Today we are going to cover another tutorial on how to log in straight to Widows 8.1 desktop. If you don’t want your Windows 8.1 to boot to the Start screen, you can bypass it and log in directly to your desktop following a simple method. Let’s have a step by step look on this. First go to your desktop. You can press Win + D to bring your desktop screen if you are not there already. Now take your mouse pointer to the taskbar and make a right click. A menu will appear. Click on the Properties option. 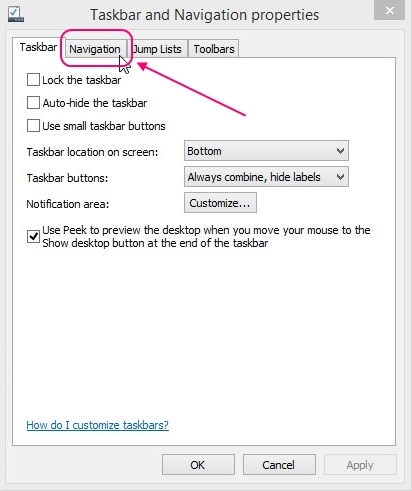 This will open a Taskbar and Navigation Properties window. Click on the Navigation tab. There you will see two sections: Corner Navigation and Start Screen. Mark a tick on “When I sign in or close all apps on a screen, go to the desktop instead of Start” option. The next time you will switch on Windows 8.1, the Start screen won’t appear and you will directly be taken to the desktop. Note: This setting also makes an additional tweak to Windows 8.1. Whenever you close all metro apps, you will be shown your desktop instead of the Start screen. 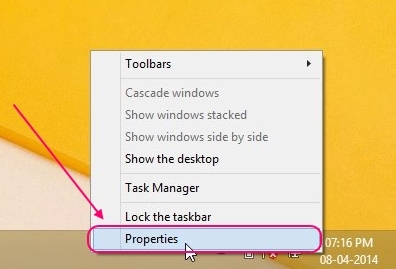 This is how you can log in straight to your desktop bypassing the Start screen in Windows 8.1. 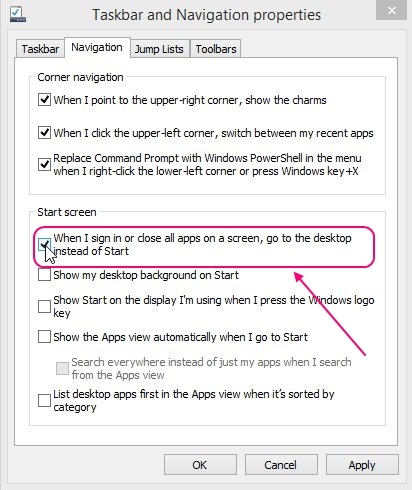 Follow these steps and get rid of the jumping to the Start screen if you don’t like it. Also check some other Windows 8 tutorials we have covered earlier. How to get the Start menu back in Windows 8. How to add a Live Tile Clock to Windows 8 Start screen.